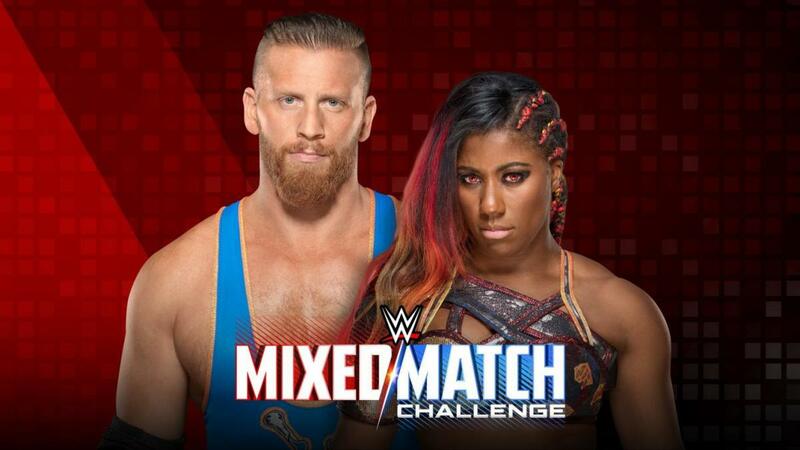 With Braun Strowman out of action, Ember Moon will be teaming with Curt Hawkins in the Mixed Match Challenge season two playoffs. Hawkins replacing Strowman in the tournament was announced during tonight's episode of Raw. The Mixed Match Challenge playoffs will begin on this Tuesday's episode, with Moon & Hawkins facing Alicia Fox & Jinder Mahal and Mickie James & Bobby Lashley vs. Bayley & Finn Balor. Ember Moon defeated Fox on Raw tonight and was accompanied by Hawkins for the match. Mahal defeated No Way Jose. On commentary, Michael Cole pushed the storyline that Baron Corbin is punishing Moon for having teamed with Strowman. Hawkins has lost 236 straight matches. Alexa Bliss, who was Strowman's Mixed Match Challenge season one partner, was supposed to team with him again before being forced out of the tournament due to injury before it began. Moon was her replacement. Charlotte Flair & Jeff Hardy vs. Carmella & R-Truth and Asuka & The Miz vs. Naomi & Jimmy Uso are SmackDown's quarterfinal matches in Mixed Match Challenge. The finals of the tournament will take place at TLC on December 16, with the winning team entering their respective Royal Rumble matches at number 30 and receiving "an all-expenses paid vacation to anywhere in the world."